Happiness is...a very big and very interesting pile of books on your bedside table. 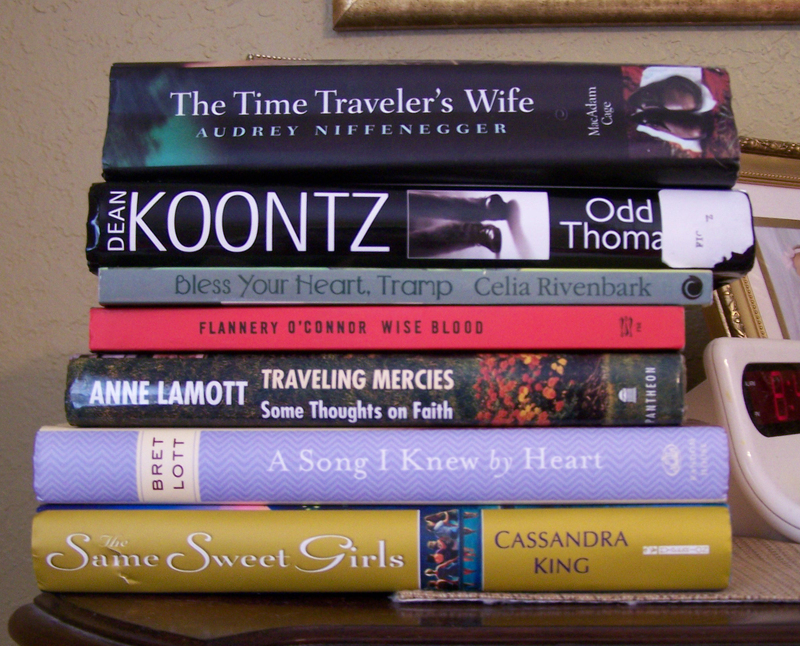 This lovely picture is my own to-be-read stack, and my heart beats a little faster just looking at it. Yep, they're all mine--not a library book in the lot of them. I think everyone probably knows this already, but just in case--did you know that you can buy used books at unbelievable bargains at Amazon? Just look up your book title, and underneath the details click "47 new and used" (the number is different for each title, of course). Very often you can buy books for--yes, really--under a dollar. Even with shipping (which, domestically, is around $3), that's a bargain for a perfectly fine book. And it's cheaper than the $5 overdue fine I always rack up when I use the library. Best of all, I'm building my own little library here at home. I've probably ordered 30-40 books over the last couple of years this way, and I've not had a single bad experience. The shipping is sometimes a little slow, but who really cares? Anyhoo, that's my story and I'm sticking to it--cheap books from Amazon most definitely work for me! Have a clever idea you'd like to share? Blog about it at your place and leave a link below. WFMW guidelines can be found here. You know, I do order from Amazon from time to time but I'm always a bit nervous about buying used. I'm afraid they books won't be in good shape when I get them. You've had good luck? Maybe I'll try it soon. I love Powells.com and Alibris.com for used books. They're both great resources, though Powells runs cheaper for shipping if you're buying many books at a time. Alibris accesses more stores so it has a bigger selection but because your order ships from several places it's more expensive to ship. I do like Amazon--I was visiting Seattle a few years back and my rental car broke down. I went into the nearest building to make a call and the security was amazing. Found out later it was the Amazon headquarters. I've heard the way they make money is that Amazon allots more money than needed for shipping, so when it says "shipping, $2.49," it will only cost the seller 1.59 or so. Doing hundreds of books this way, it could really add up. I've sold a number of books on Amazon, and I vouch it to be true. This wasn't for business, so I really didn't make a ton of money. But I think that's at least one avenue where they profit. Love used books. Haven't found any for a penny, but my Half Priced Books does 50 cent books a lot and that has set us for homeschool needs. I just finished reading the Same Sweet Girls 2 books ago. LOVED IT! And being an Alabama girl myself, I could relate and knew exactly every place they were referring to. Enjoy!!! Did you know that if you volunteer at your local library for an hour or so each week, they will waive your fines and you will have access to the newest releases?? I'm a seller over on Amazon UK. For the 1p books the profit is basically in the postage. I get £2.something for each book I sell and the postage cost is usually between £0.60 and £1.80 depending on the size of the book - the difference is the profit. Incidentally, if you like buying books on Amazon then you'll love BookMooch. This is basically a free book exchange which works on a points system. I started using it a few weeks ago and love it to bits! I've gotten a few out of print books that way but just didn't think about it for regular books (duh!!) I need to check there for a book on my spring reading list that is not in the library or in my local Barnes and Noble. I have wondered how they sell books for just a few cents, too! It almost seems like it would be too much trouble for no profit. Maybe they're just book lovers who want to see books go to a good home? I don't know; it's crazy. But I'm more than happy to pay that price if they're willing to sell! LOVED Traveling Mercies and Time Traveler's Wife - I'm a little jealous that it is not me reading them brand new again. Enjoy! Hi- I just wanted to say that I LOVE your WFMW links! I have gotten so many Great ideas and found so many wonderful new blogs this way. I was so inspired that I had to start a blog just so I can share too! Just wanted to 2nd to paperbackswap.com there is also a thing called bookcrossing. Look at bookcrossing.com people leave books at different public locations, list it on the web site and you just go pick it up. A little fun and adventure mixed with your love for reading. I have a post of my ideal mall where I have a photo of some of the books I buy at Goodwill. I have found more than these pictured. MacDonald, Piper, C.S.Lewis, Sayers. I love books. I love bargains. I messed up link number 71! Can you delete it? SORRY!!!!! The Odd Thomas books are good, although the first (the one on your nightstand) is best. Thanks for the tip - I intend to use that one as I have a pile of books I want and I love second hand anyway. I'm surprised no one has mentioned half.com--I always buy my books there. 75 cents is the cheapest + shipping. If you buy more than one item from the same seller shipping is reduced on the subsequent items. I buy all my books at Amazon.com usually...I'll have to check out Half.com...that sounds like a great deal. Also, selling books through amazon.com is a great way to make money! I'll have to look into this! The only English language library here charges high yearly fees and takes a long time to get newer stuff. I saw your copy of "The Time Traveler's Wife" in the photo- you will love it! I'm sorry Shannon. I saw your stack of books and I drifted off into heaven as you have my favorite two books in the world sitting on the top of your stack. I heartily agree with buying books this way, although sometimes you need to inquire as to whether or not there is any sort of inscription or book plate in it. That's the only flaw I've discovered so far. I love Amazon and sell books on there as well but I truly love paperbackswap.com plus swapacd.com Both are fabulous and you don't pay a penny for a book...just postage if someone wants one of yours. Our library's semi-annual used book sale is this weekend. You can get everything you can fit into a bag for $4 on the closing day. I love Amazon, and buy my books almost exclusively from them. Great tip! Great tip! I do this myself, eXcept I only buy from sellers with 99% or better ratings. Like you, I don't mind waiting for slower media mail to save a few pennies. Enjoy your great stack of books! ThanX for another great WFMW. Ok, I sell books on amazon, and can tell you figures.I'm in the UK so it won't really help, but I'm gonna do it anyway - it's probably similar. If I sell a book for 1 pence, the customer pays that 1p plus £2.75 postage etc costs. From that I get £1.41 to post the book and then keep the rest as profit (the other £1.34 goes to amazon as fees). Typically I pay around 60p to post a book, and I recycle padded envelopes (My Mum saved them for years!) or use bubble wrap and old envelopes. That way I get around 81p profit. Obviously, it depends on the weight of the book, and I prefer if I can sell it for more, but I try to look at what other people are selling books for and price mine accordinly. Yes, I love Amazon's used books deal! It's saved us tons of money on home schooling books. I've even sold some books through Amazon, but it's a bit tricky when you've got the penny people as competition. I've wondered about that myself, but not long enough to stop me from placing my order! I am a fairly recent reader of your blog. I have been lurking for a while, but I HAD to delurk after the first line of your post today. I LOVE LOVE LOVE reading too and have been an avid reader ever since I could read. I get the same deep down feeling of happiness and contentment when I know I have a pile of books waiting for me at my bedside book basket. Love your writing. Wish I had more time to read and write! There are only 24 hours a day, more is the pity. Wishing you God' s best. I love that on Amazon! I use it all the time! Half.com is so great too! I just got my next book club book for a whole dollar! Amazon is the best. All the used books I've bought from them look better than just about any new one after one day at our house! And for cheap. Haven't participated in WFMW in a while, but I thought I'd join in again. Wow, you've been at this at LEAST a year now, huh? You're amazing. The trouble is that I have too many of them! I hate to part with books, and so they suffer, packed away in boxes beneath the bed (because every available shelf space is already full!). Cheap books? For me they're a blessing AND a curse! Being such a tightwad, it absolutely KILLS me to pay more for something in shipping than the price I'm paying for the item. We use the library a lot, but for books unavailable at our library, or needed for longer term, I've had great luck both buying and selling used books on Amazon. I love being able to buy something for one child, quietly together at my computer, after dinner and homework time, rather than taking five kids to an overpriced bookstore during rush hour. Not only is it more focused and easier, but much cheaper as there are no compromise books (because we couldn't find what we needed) or compensation books (for the other kids who suddenly must have something as well). The book usually arrives before we could have scheduled an afterschool field trip to the bookstore. They make money on the shipping. Amazon collects about 3.50 from you and gives about 2.50 to the seller who ships it for about 1.50. I've sold about 1000 copies of Screwtape Letters on Amazon and have another 4000 to go. I work in a used book store and I sell used books at Amazon, Alibris.com, and ABE.com. Sometimes on Amazon you will find books for a penny. If you know what you are looking for, you can do a search on www.bookfinder.com which searches many used book clearing-houses. I have a library so large myself, I don't think I will live long enough to read everything I have. Used books are among the best bargains around. Check with your library to see when they have a used book sale. That's another good source for cheap books and then there's always your local thrift store.